So, if you can believe it, Walmart sells a strawberry cheesecake ice cream that's actually pretty damn good. This is my closest approximation of it. Before you turn your nose up at it, I've given out several samples of this and received nothing but good feedback. 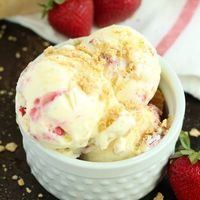 It's a very simple recipe, to be sure, but if you're looking for a creamy strawberry cheesecake this fits the bill quite nicely. INW Biscuit does a nice job giving us the little crumbs of crust that are littered throughout the ice cream. TPA Marshmallow, CAP NYCC, and TPA VBIC give a nice, sweet cheesecake ice cream without any sour notes and a thick, creamy mouthfeel. FA Juicy Strawberry was my go-to here because it gives a sweet candy strawberry syrup flavor that stands up well by itself among the creams. If you don't have Juicy Strawberry, you can probably get away with subbing a Strawberry Ripe/Sweet blend with emphasis on the sweet strawberry, but you'll lose some of the inherent juiciness that you get from FA. I don't think people who get pepper from TPA VBIC will be bothered too badly by it at 1% here, and I wouldn't recommend subbing CAP in because the slight spice that comes from TPA VBIC fills in the body that would be a little thin using NYCC alone at only 3%. *Edit: I knew I had cribbed this cream base from somewhere, but couldn't remember where. I went back and looked, and I have to give credit to @Thadentman for his excellent work. Nice tasty mix! 👍👍 Didn't have juicy strawberry, so I threw in my own strawberry combo... But the rest of the mix comes together nicely! 30ml barely made it thru to the recommended steep time! Nice job!